Search Results for "plumber repairing sink pipe"
Hands of a worker that is repairing a pipe in a water leak on a road in Taipei, capital of Taiwan. Taipei, Taiwan-25 November, 2014: A worker is repairing with his hands a pipe that is broken on a road in Taipei, capital of Taiwan. A worker is repairing with his hands a pipe that is broken on a road in Taipei, capital of Taiwan. The man in working gloves rotates a metal cable clockwise. The man in working rubber gloves pushes a metal cable in a hole on a floor. Man's work of the plumber in the toilet room. 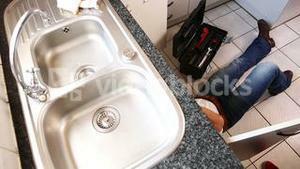 Man repairs sink of kitchen while woman wipes. 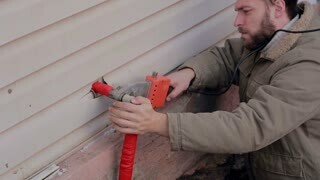 Man working outside, making seam with soldering iron pipe. Plumber welded plastic pipe. Two men making emergency repair. Man standing in a hole in the earth and making repair of water system. 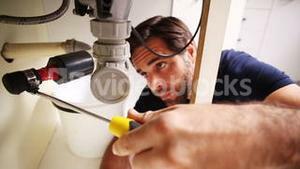 Plumber installing a grey plastic pipe. Man in a hole in the earth and making emergency repair of water system. Plumber working with grey plastic pipe. Two men making repair of water supply system, using the tools. Plumber fixing pipe system outside. Accident on street. Woman under the sink checking the pipe connectors after fixing the plumbing, 60 fps. Woman under the sink checking the pipe connectors after fixing the plumbing, 23.98 fps. Woman under the sink unscrewing a pipe connector with tools to fix plumbing, 60 fps.